The ICY Vision-A cooler contains 5 power heatpipes in a unique heatpipe configuration. The heatpipes are interlaced into 85 optimised high-quality Aluminium fins. Together with a flat stack fin soldered Copper base, they enable the most efficient heat transmission and dissipation from GPU core in its class. Besides the heatsink, two 92mm UV-reactive fans with 11 blades in S-shape generate 20% more air flow than traditional fans and each fan contains a high-quality ball bearing to ensure a longer lifetime in high temperature environments. 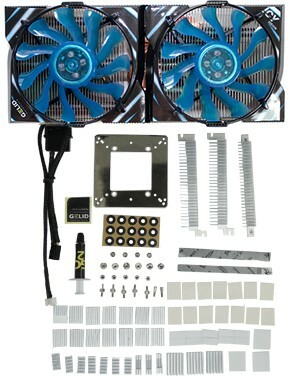 Both fans are wired together and are powered by a single 3-pin fan connector which connects to any free 3-pin fan header on the motherboard and they do run at full speed so if you prefer to have some control over the Icy Vision's fan speeds, we would recommend that you use a Gelid Fan Controller or similar fan controller, which will allow you to set your preferred cooling/noise balance. AMD HD5850, HD5870, HD6850, HD6870, HD6950, HD6970, HD7850, HD7870, HD7950, HD7970 (The compatibility list is based on AMD reference board layouts). The Icy Vision will take up three spaces when installed in your case, so if you only have two PCI-E slots that are placed really close together the you probably won’t be able to run a dual card configuration with the Icy vision installed. 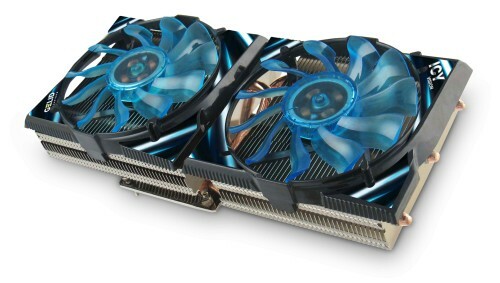 It is important that you check with your card's manufacturer prior to fitting the cooler that your card adheres to the reference designs issued by AMD otherwise the cooler may not fit. If you are not sure then the best way to check is to mount the cooler in place without using either the thermal paste or any of the supplied heatsinks. Once you are happy that the cooler fits it is then safe to remove the cooler and install it correctly according to the supplied instructions. Only fit the cooler once you are 100% sure it will fit as once the thermal paste and heatsinks have been used the item becomes non-returnable. Should you find the card does not fit and you haven’t used any of the heatsinks or the thermal paste then the card can be returned for a refund. It is a very good cooler and comes with plenty of accessories. However, the fans do not have PWM, which means they run at max speed all the time (which is quite loud). I am using a vga to pci adapter and a pci splitter, in order to install two 92mm PWM Noctua fans (they will run quieter and will use the graphics card drivers fan curve). Ordered mid afternoon and arrived morning next day which was so quick. Lots of parts in box due to the amount of different possible cards it supports. I put it on a Radeon 7950 and was easy enough to do even though I struggled with instructions due to not so great eyesight and small print. Pretty obvious what goes where and although a little fiddly was okay and took about an hour to do. It came with a small syringe of thermal paste but I had ordered the extreme paste so used that. Ran Wolfenstein and saw max temp 49 degrees against the previous stock cooled 80 degrees. Idle was 26 degrees against usual 50 plus. Incredible difference and fully justifying the cost and time spent installing. Thoroughly recommend. Installing is a little fiddly, several parts are small enough to need tweezers and getting the protective paper off the VRAM thermal tape is also tricky. I strongly advise you to use a magnetic screwdriver and/or do it on a table with a raised lip or rim so any parts that may drop cannot roll off and fall onto the floor. Once installed and running it's noticeable at stock speed though not massively so, but if you want to quieten it down you'll either need to get the FanMate these guys suggest or some other form of external controller (I had a spare FanMate from my VF3000A). Given its cooling capacity, it's quite light and compact but you'll NEED three clear slots, (one for the card, two below it) but that's not an uncommon issue with aftermarket coolers so no loss of Brownie points. Cooling? I'm still tinkering to find the best balance but with the fans about as loud as a my Antec Tricools at medium 66C under the Furmark extreme 1080 benchmark, the XFX DD cooler it has replaced got closer to 80C with MUCH more noise, so a very good improvement. I find it a little odd that, although they do provide a 4 pin lead so you can plug it directly into the cards header, the fans can't be controlled through the drivers nor do they work under PWM temperature control. Hopefully they'll correct this in the near future because it's otherwise pretty near perfect-especially for the price.